Bleak skies and sleet didn't seem to bother preschoolers swinging on the Saxon Hill School playground as they chattered last week about sledding and holiday wish lists. Their parents and teachers, however, have something weightier on their minds: finding a new location for the school. For the last 29 years, Saxon Hill has inhabited a red clapboard building beside Jericho's historic Old Red Mill. 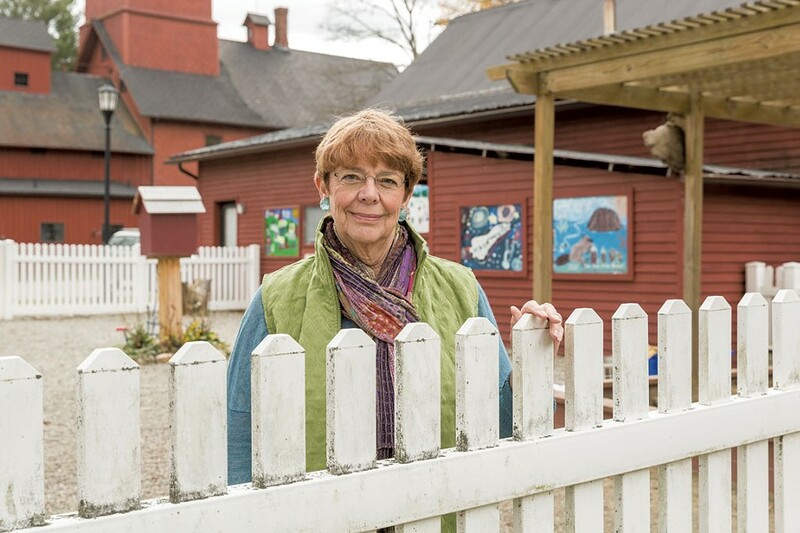 The Jericho Historical Society owns the space and rents it to the school, which, at 50, claims to be Vermont's oldest parent cooperative-run preschool. By most accounts, the rental arrangement has been amicable. Which is why parents say they were surprised when — seemingly out of the blue — the historical society told them Saxon Hill would have to leave when its two-year lease ends this summer. "We were in no way prepared for it," said Emily Banks, a parent and president of the school's board. "We can't just pick up and move willy-nilly," said Michele Campbell, who's worked at Saxon Hill for more than two decades, as she scanned the property. "We need to be able to find a place with some of the amenities we have here." Oblivious to the cold, four kids climbed over logs in the woods; several others scampered up and down what will become their sledding hill in winter. On less-slick days, kids climb trees in a wooded area known as the Mighty Jungle. The playground boasts a zip line, a slackline on which kids balance and a sculpture garden, as well as a standard swing set and sandbox. The historical society voted 10-to-1 against renewing the lease during its September 11 meeting because, board president Ann Squires explained in an interview, it's trying to extend the lifespan of the property's leach field as long as possible. "A preschool uses a tremendous amount of water," she said. Replacing the septic system could cost upwards of $100,000, Squires continued — in part because it's located next to wetlands and a river at a time when the Vermont Agency of Natural Resources is developing more stringent septic standards. Saxon Hill School has used the same leach field for the last 24 years, and when the leach field for the mill and nearby millhouse failed four years ago, those buildings began sharing the school's. In an effort to take pressure off the septic system, the historical society plans to convert the school building to an office for one or two individuals. It doesn't currently intend to terminate the leases of several individuals who live on the property. 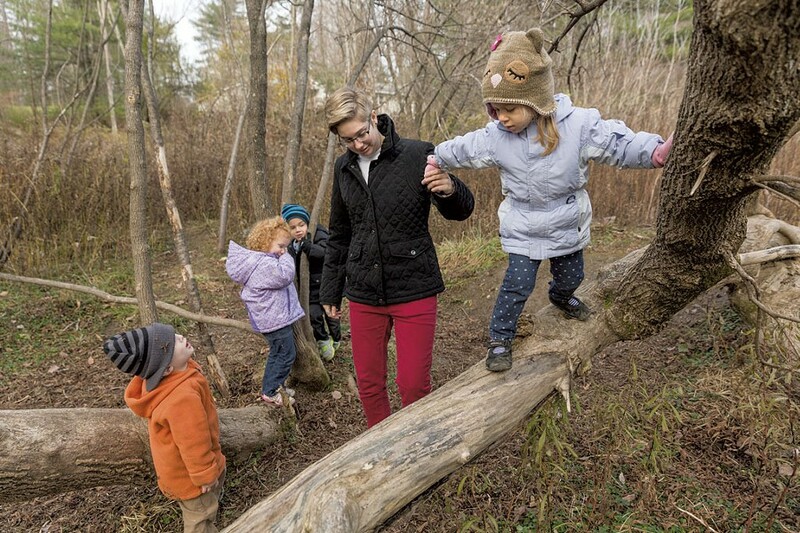 Forty-nine children ages 3 to 6 are enrolled at Saxon Hill, a certified preschool and kindergarten that draws families from surrounding towns, including Underhill and Essex. Parents rave about the place, where children are encouraged to be autonomous and spend lots of time outside. Kids use knives to prepare their own snacks and are given access to hammers and other real tools. "Kids are treated with a tremendous amount of respect," recalled Laura Hill, a Jericho resident whose two daughters spent two years at Saxon Hill. "It's kind of wild." According to Banks, the co-op model keeps tuition low — the annual cost to attend three days a week is less than $3,000. Parents do everything from teaching to shoveling snow. Not surprisingly, the school has a loyal and active group of parents — current and past — and alumni. Sabrina Leonard, a mother of three whose 3-year-old son is enrolled, isn't the only former student who now sends her own children there. "Most of our current friends are parents from Saxon Hill School," said parent Deanna Papaseraphim. "There's this connection that is ongoing no matter when your child went there." Daunted by the prospect of having to uproot their entire school, parents pleaded for another year. The historical society responded to their October 14 letter with a three-sentence letter declining to extend the lease but offering to serve as a reference for the school. Earlier, the historical society had agreed to give the school another month — saving it from having to move before the end of the school year — but no longer. Jericho, a town of roughly 5,000 people, has a rich history. It consists of three villages along the Browns River that collectively boast the state's oldest general store, a town green and several historic churches. Jericho was the birthplace of Wilson "Snowflake" Bentley, a farmer who gained fame for his photographs of snowflakes. The Jericho Historical Society, a nonprofit formed in 1972, has played a key role in preserving the town's heritage. In addition to maintaining the buildings themselves, it runs a craft shop and a Bentley photo exhibit in the Old Red Mill. Squires said the historical society is simply fulfilling its role: "We are stewards of this national historic site, and it's our job to protect it." Timing appears to be the primary source of friction between two cornerstone institutions of the Jericho community — and the "part that incites panic," according to Leonard. "The essence of the school is not physical space. We could easily recreate this somewhere else. Just the time frame is what seems unreasonable." Squires contended that the historical society gave ample notice to the preschool. "We notified them as soon as we figured out we had a problem," she said, pointing out that if the current septic system does fail, the preschool would be displaced in a more abrupt fashion. Parents also say they are worried about what the uncertainty will mean for the school's bottom line. It could disrupt the themed summer camps Saxon Hill runs — in robotics, Legos and arts — which bring in approximately $12,000 in revenue each year, according to Banks. Prospective parents may also be put off by the school's impending displacement. "My guess is we're going to have problems filling spots," Campbell said. "We need, at minimum, 80 percent enrollment to match operating budget," explained Papaseraphim. "I hope this doesn't send us off the deep end." Adding to the frustration: Parents say they haven't gotten clear answers about why the historical society is booting them so abruptly. They wonder: Is the septic situation so dire that they can't stay another year? "We tried to get more details or information to see if there is any immediate danger," Banks said, but the board has rebuffed requests to discuss the issue in detail together. Campbell put it this way: "If there is an issue that arises with children ... We teach them to all work together to come to some sort of a compromise. For me as an educator, it's very frustrating when grown-ups refuse to do that." Regardless of the current spat, parents credit the historical society with being "incredibly generous" for renting the space to Saxon Hill at a reasonable rate for as long as it's been there. A few landlord-tenant problems arose, but nothing serious. According to Campbell, historical society members have expressed concern that the children erode the soil when they play in the woods. They also requested that the school remove its zip line and slackline from the woods out of concern that they would damage the natural area. Squires said those problems had been "ironed out" and did not contribute to the historical society's decision. "We have put money into this building year after year — new flooring, new lighting, new toilets — which is not typical for a tenant," said Papaseraphim. "We've been wonderful tenants." She pointed out that the school recently invested thousands of dollars in a new playground. Parents are circulating a petition around the community, hoping to put "gentle pressure" on the historical society to extend the lease. But they aren't banking on it. They've started scoping out new locations and are drawing up contingency plans — such as renting temporary space in a church or another school. Banks said they've found one potential site, but it won't be available by their move-out date. They want to stay in Jericho — a central location for families coming from surrounding towns. Despite Saxon Hill's prominent place in the community, many aren't aware of the school's predicament. A woman volunteering at the craft store across the street hadn't heard anything about it. Neither had Rep. George Till (D-Jericho) — though he did note that Saxon Hill School was the reason his family moved to the town 26 years ago. Hill and other parents are starting a capital campaign to raise the $150,000 they estimate they'll need to cover costs associated with moving to a new location. "Everyone wants to help," Banks said. Like the preschool, the historical society is trying to buy time and make the most of limited resources. "This is a national historical site, so what the board said was we would do everything possible to extend the life of the septic system as long as possible," said Squires. Leonard said that the school, which started in 1964, should be considered an important piece of Jericho's heritage. "I grew up in Jericho. My dad also grew up in Jericho ... In terms of preserving the legacy of Jericho, I feel really strongly about that, too, but Saxon Hill is just as much a part of that legacy."